Stick It to ‘Em: Playful Stickers to Color & Create: 275+ Stickers with Sass for Family, Friends, and Frenemies by Bailey Fleming is a unique collection of stickers and tools for doodling and creating your own stickers. My daughter hasn’t created her own yet, but she’s had a great time coloring the pre-made stickers and sharing them with her parents — putting them on our phone cases and laptops. I’m just happy they are not all over the house. What’s great about this collection is that it is for young and old alike, as some of these stickers are for adults to deal with their own stresses through coloring and creating their own snarky comments and pictures. Some recommended tools for creating colorful stickers include felt-tip pens, colored pencils, water color paints, and brush pens, among others. There are techniques for adults and kids to use to create visually enticing lettering for logos and sayings on their stickers, as well as ways to enhance those statements with accompanying doodles. There are even pages that break down images into simple steps to make them easier for kids to replicate in the blank sticker spaces. 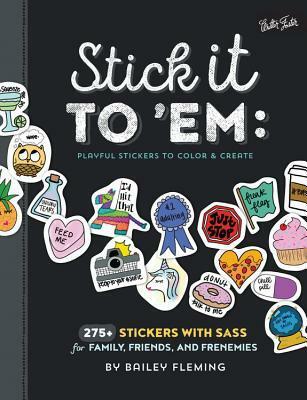 Stick It to ‘Em: Playful Stickers to Color & Create: 275+ Stickers with Sass for Family, Friends, and Frenemies by Bailey Fleming is an excellent creative outlet for young and old. Let your imagination soar with these stickers.